The "unholy committee" has finally judged all the 7DRLs of this year. I think they liked Drakefire Chasm. Let's celebrate that with version 1.2. The game now has two new dragon types to play; Green (poison) and Blue (lightning). Both have four new abilities, which replace Red's fire themed ones. And of course their breath weapons are of their own element. In addition, each color gains +1 to one attribute. This makes the first level bit easier, at least for Red and Blue. I made some changes to half of the Strength-based abilities, hopefully making them more attractive. I also added a new Tough adventurer and changed Shaman's type to Agile. Thus there is now an equal amount of each enemy type in the game. Although, due to randomness, you're still not guaranteed to get a bonus to the attribute you want on each level. In v1.0.1 I added a score bonus for victories. However, if it took more than 3000 turns to win, the bonus was actually negative, and the victory very likely didn't show up in the game's highscores. Thanks to Game_Hunter for making me realize this. I changed how the bonus is calculated and victories should now always top the highscores. 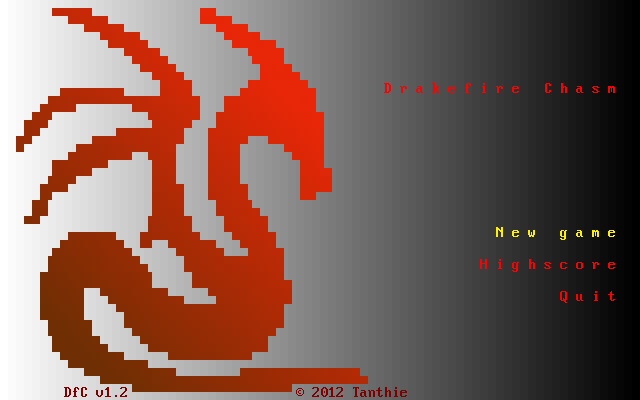 This is probably the last update (excluding a bug fix/balance tweak release) for Drakefire Chasm. I have two other projects I'd like to work on, and maybe even get releases out at some point. Liking the game a lot! However there is a bug with vikeys: they get mixed up when using the 'w' run command and targeted abilities, 'h' is switched with 'k'. Moving works fine. Not a severe bug but still bothersome. Argh. I thought had made everything use the same inputDirKeys() function already but I guess there's still some place that has its own input code. Thanks for pointing that out. I'll release a fixed version tomorrow (today).